The pictures make this whole thing look a heck of a lot better than it actually was! It was raining in the morning when mom and I headed towards Bardstown where we would eventually take a country road down to Rt. 68 in Lebanon, KY. We decided to go anyway, thinking that the die hards would be set up anyway and we'd have less competition from other buyers! By the time we got to that area, it was no longer raining, just overcast, slightly chilly and mostly deserted! We ventured on and made our way through small town after small town carefully maneuvering windy roads. There just weren't many set ups. Don't know if it was due to the weather or the area itself. This one was so different than the Hwy 127 yard sale Tim and I had so much fun on last year! The little corner drug store with its old soda fountain was no longer in business (closed a year ago!) and so we ended up at Pizza Hut for lunch. 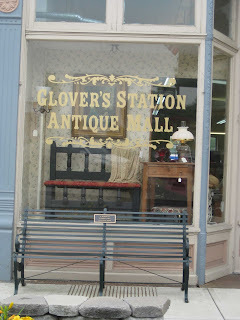 The best shopping of all was at an antique mall in Greensburg, KY on the town square. They were very pleasant and accomodating and most of the booths had sales because of the 400 mile yard sale. I found quite a few things there, mostly books, paper and sewing magazines. Mom bought a bride doll and an old 1940s Sears catalog. As the day progressed, we found less and less and were getting weary of the barren countryside and semi-appalachia of it all. By the time we arrived in Glasgow and hit an antique mall there, I had had it and we decided to throw in the towel and just return home for the night instead of staying in Bowling Green and venturing on towards Paducah the next day. So, as I said earlier, you win some and you lose some. Of course, I still came home with 3 boxes of goodies mainly for my etsy shop! I found three little flocked ornaments that will go on my 1950s/1960s Christmas tree later this year that are keepers. I will also probably end up keeping the old early 1900s window store display book too! Lots of readers and books as usual!